Practice What You Preach: Can World Religions Coexist? This was a conversation featuring leaders of multiple faiths and audience participation. Pastor Michael Bunton (Baptist Pastor at Greater Friendship Baptist Church) – Pastor Michael Andrew Bunton was born to William A. Bunton Jr, Senior Pastor of Antioch Missionary Baptist Church in Buffalo, New York, and First Lady Wanda Lee Bunton. Pastor Bunton is the youngest of five siblings. Pastor M.A. Bunton was licensed in 1989 and ordained into ministry in 1992 by Senior Pastor William A. Bunton Jr. who has been pastoring for over 60 years. Rabbi Michael Oblath, PhD (Jewish Rabbi at Congregation Beth Sholom) – Rabbi Oblath has been a Rabbi of Congregation Beth Sholom in Anchorage for 10 years. He earned his doctorate in Ancient Near Eastern Religions from Graduate Theological Union and UC Berkeley in 2001, with emphasis (and dissertation) on the exodus from Egypt. His academic, and rabbinic, interest is primarily in the critical analysis of the biblical text (and teaching it within its original, as well as evolved, context). Ajahn Sompon (Buddhist Monk at Wat Alaska Yanna Varraran) – Born in Roi-Et, Issan, Thailand in 1973; came to Pasco, Washington in 1998 after serving as a Buddhist novice in Roi-Et beginning at the age of 13 upon completion of Middle School. Before coming to Alaska in July 2017 served at the Wat Richland Buddha Wanaram for 18 years. After seven years service as a novice, took the title of Ajahn (teacher) as a forest monk in Chonburi, Thailand at Wat Yanangvararam. Malcolm Roberts- After graduating from Princeton University in 1958 with a history degree, Malcolm began his career as a photo journalist, speech writer, issue correspondent, policy advocate, author, monthly columnist, and editor. RECORDED: Thursday, September 7, 2017 at East High School auditorium. 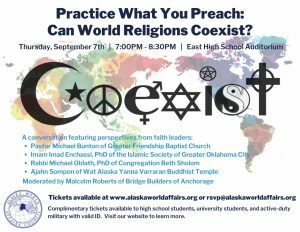 ABOUT: Alaska World Affairs Council Presents is a public service partnership of the Alaska World Affairs Council and KSKA Public Radio. You can attend a variety of live AWAC speaking events in Anchorage. Check out the list of upcoming speakers and topics on the AWAC Events Calendar. SUBSCRIBE: Get Alaska World Affairs Council Presents updates automatically — via email, RSS or podcasts. Eric Bork, or you can just call him “Bork” because everybody else does, is the Audio Media Content Producer for KSKA-FM. He produces and edits episodes of Outdoor Explorer, Addressing Alaskans, as well as a few other programs. He also maintains the web posts for those shows and many others on alaskapublic.org. You can sometimes hear him filling in for Morning Edition or find him operating the sound board for any of the live broadcast programs. After escaping the Detroit area when he was 18, Bork made it up to the Upper Peninsula of Michigan, where he earned a degree in Communications/Radio Broadcasting from Northern Michigan University. He spent time managing the college radio station, working for the local NPR affiliate and then in top 40 radio in Michigan before coming to Alaska to work his first few summers. After then moving to Chicago, it only took five years to convince him to move back to Alaska in 2010. When not involved in great radio programming he’s probably riding a bicycle, thinking about riding bicycles, dreaming about bikes, reading a book or planning the next place he’ll travel to. Only two continents left to conquer!